IBM MQ has a Spring Boot Starter, allowing Spring developers an easy way to configure the IBM MQ JMS package. MQ enables applications to communicate and share data between themselves in a reliable and scalable way that decouples one application from another. In this way, it assists the integration of applications running in different frameworks, languages, platforms, clouds, and locations. This tutorial shows you how to use the MQ Spring JMS Starter to access an IBM MQ server from a Spring Boot application. This example uses a local MQ instance running in a Docker container. You could also use an MQ server in IBM Cloud. The application includes an example pair of REST endpoints through which messages can be sent and retrieved from MQ. Build the app and invoke the REST endpoint and display the results from MQ. Maven and Java installed on your computer. It is assumed that you can build and run a Maven based Spring Initializr project. Docker installed on your computer. It is assumed that you are able to start/stop containers and are generally familiar with Docker. This tutorial should take about one hour. 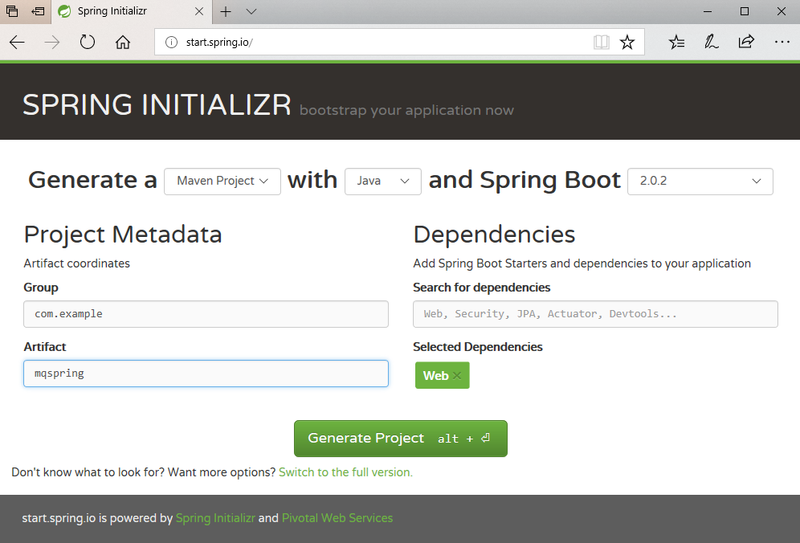 On the Spring Initializr page generate a Maven Project with language Java, and the Web dependency. For this example, we use group com.example and artifact mq-spring. Download the project and unzip it. The default configuration for the local MQ Server includes a user of admin with a password of passw0rd. This can be passed to the application via the normal Spring application.properties file. Note: It is not recommended to store credentials in your application. We do so here only for the sake of simplicity in this tutorial. The MQ Spring Boot Starter can utilize other property sources such as environment variables, etc. For this example, we’ll create a simple REST application with an endpoint that sends a message via the MQ Server and a second endpoint that retrieves and returns sent messages. @RestController to enable REST endpoints. Add a REST endpoint to the with the @GetMapping annotation with a path of send. Use the JmsTemplate convertAndSend method to send a message Hello World! to the queue DEV.QUEUE.1. Add Exception handling as required. Note: The queue DEV.QUEUE.1 is precreated by the IBM MQ for Developers container. The method is kept brief for this tutorial, a real application would likely have better exception handling and can use typed objects as message payloads. See the Spring guide for Messaging with JMS for more information. Add a REST endpoint with the @GetMapping annotation with a path of recv. Use the JmsTemplate receiveAndConvert method to receive a message from the queue DEV.QUEUE.1. Add Exception handling as required. Note: The JmsTemplate receive methods are blocking! (You can try this by invoking the recv endpoint before invoking send and it will not return until send is invoked, unblocking the receive call.) For a non-blocking alternative, consider using a @JmsListener. Now you can invoke the REST endpoint for send, http://localhost:8080/send. You should see the OK reply from your endpoint confirming that the message has been sent. The IBM MQ Spring Starter makes it easy to send and receive messages from an MQ Service using Spring’s JmsTemplate API, with Spring auto configuration.